I work as the Fisheries Technical Specialist for the East Midlands region, advising the Environment Agency and our stakeholders on fisheries issues. This involves encouraging the consideration of the natural environment with a focus upon fish health and habitats, and fishing activities. This includes assessing the impacts of new developments, designing fish and eel passes, writing technical guidance and undertaking projects to improve fish habitat. I was introduced to fishing by my Dad when I was 3 years old, which began a lifelong obsession with fish, which prompted turned my hobby into my career. I’m a keen angler and fish all over the country for a wide range of species. 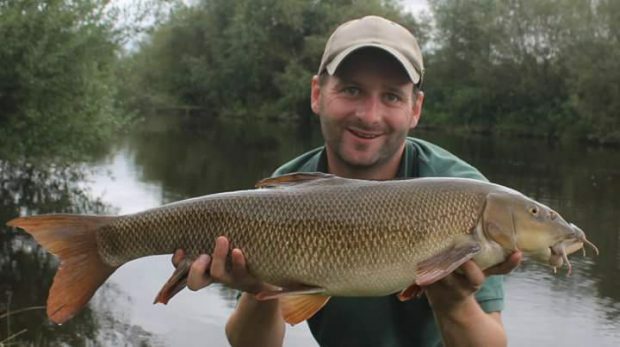 I enjoy specimen carp fishing, wild trout fishing in Cumbria and barbel fishing on the River Trent. My favourite place to fish is the River Wye in Herefordshire, predominately for barbel in the summer/ autumn or pike in the winter because of the beautiful scenery and extensive variety in angling. I find fishing a very relaxing pastime, and I enjoy being outside, surrounded by the peaceful and beautiful countryside, watching wildlife. The buzz of catching a fish is a thrill I continually seek and I strive to improve my skills to catch more fish. Many of my friends and family share this passion, making fishing together a good opportunity to socialise with friends, chatting about our latest catch and sharing stories. 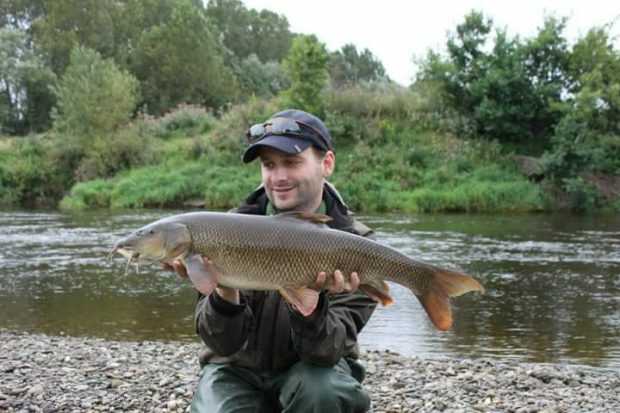 I got into barbel fishing at a young age and it didn’t take long for the species to become my favourite to target. Unfortunately there wasn’t much opportunity to catch them where I grew up in the North East of England. My Dad took me for a few days fishing on the River Wye where I fell in love with the river and the barbel that swim within in it. We didn’t really know what we were doing but on the first day of our trip I was lucky and caught a 9lb 2oz barbel followed by a 10lb 6oz barbel. A 10lb barbel was something I had dreamt about and never thought I would catch. I will never forget that day, especially our excitement at the size of the fish as we were trying to net the big barbel. We still chat about that fish regularly and it always brings a smile to my face to think about it. The barbel is not native to the wye. People are getting rid of non native weeds like Himalayan Balsum and Japanese Knotweed . Will the non native barbel be next as it has an effect on any main river salmon eggs and salmon lies. Barbel (Barbus barbus) are native to England and Europe. The species may have been locally absent in western flowing rivers until the last century, but are not a non-native species, and as such there is no eradication programme. We are not aware of any scientific evidence of barbel having a significant negative impact on salmon stocks, but we do know that barbel fishing brings in revenue to the local economy and supports local fishery partnerships and river improvements.